Victory over the dark forces during the feast of Bas-solas should have guaranteed safety for the continent. Instead, Willet and the rest of the Vigil discover they've been outsmarted by those seeking to unleash the evil that inhabits the Darkwater. Jorgen, the member of the Vigil assigned to Frayel, has gone missing, and new attacks have struck at the six kingdoms' ability to defend themselves. Just when the Vigil thought they had quenched the menace from their enemy in Collum, a new threat emerges: assassins hunting the Vigil, men and women who cannot be seen until it's too late. The orders of the church and the rulers of the kingdoms, fearing the loss of the Vigil's members altogether, have decided to take them into protective custody to safeguard their gift. On Pellin's orders, the Vigil scatters, leaving Willet to be taken prisoner by the church in Bunard. In the midst of this, Willet learns of the murder of an obscure nobleman's daughter by one of the unseen assassins. Now he must escape his imprisonment and brave the wrath of the church to find the killer in order to turn back this latest threat to the northern continent. I have taken FOREVER to write this review. 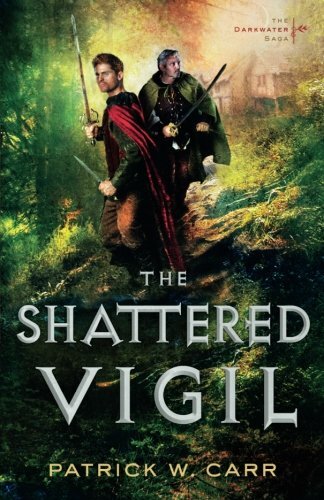 I read The Shattered Vigil months ago and have returned multiple times to write this review. There have been many iterations and at one time my review was almost 2000 words long. I thought that might be a wee bit excessive ;). I can't imagine that you want to read a comprehensive treatise rather than a book review. If you do, I would really love to meet you. My problem is that I love this series. It is everything that I love in a speculative fiction/epic fantasy series. Characters with depth that I really get to know and feel passionate about… great world building… clean... full of excitement and suspense… gripping… So what on earth is the problem? Just one… the genre. These books are marketed as Christian fiction. This is the only genre that I will get cranky about (I promise). For a book to be marketed as “Christian” it needs to meet the most basic tenets of Christianity. Carr’s work doesn’t. I post Wimmer's definition and further explanation specifically for the fact that he states that a Christian fiction story "should at all times express the central idea of salvation only through belief in God's son, Jesus Christ, and of the Holy Bible as God's word and law to humanity." (How about we avoid my thoughts on the fact that he included Catholic and Mormon in his explanation). Those most basic tenets are not expressed in The Darkwater Saga. (Just a reminder… take a look at the “cautions for Christians” portion of my review of The Shock of Night for further information.) These books should be marketed as epic fantasy, leaving Christianity out of it. I would greatly respect Patrick W. Carr if he were to take a play from Davis Bunn's playbook. Davis Bunn did it right. When he chose to explore writing outside of the Christian fiction genre he created the pseudonym, Thomas Locke. Under this pen name, he writes fantastic mainstream novels. Take a look at my reviews of his books and you will see that I rave about them. I genuinely love them. Carr doesn’t need to use a pen name, but he really shouldn’t market his books as Christian fiction. That genre is getting more and more abused (by far too many authors). Let’s keep it genuine folks. -A book list and links to my reviews for the books written by Davis Bunn (primarily Christian fiction) can be found here. -For Bunn's mainstream fiction books written under the pseudonym Thomas Locke, as well as links to my reviews, click here. So… I obviously read this, the second book in the series, and will likely continue to read any future books published in the series. I love the books. I dropped a star on the rating because of the genre issue. I hope that the lower rating will entice people to read why I have given a lower rating. I am shamelessly using this review as my plea for authenticity in marketing. Truly, read these books… enjoy them... recommend them to your children… just understand that they are not Christian. As a member of the Bethany House Blogger review program and NetGalley, I received a review copy in exchange for my honest and unbiased review. Patrick saw more of the world on his own through a varied and somewhat eclectic education and work history. He graduated from Georgia Tech in 1984 and has worked as a draftsman at a nuclear plant, did design work for the Air Force, worked for a printing company, and consulted as an engineer. Patrick’s day gig for the last eight years has been teaching high school math in Nashville, TN. He currently makes his home in Nashville with his wonderfully patient wife, Mary, and four sons he thinks are amazing: Patrick, Connor, Daniel, and Ethan. Sometime in the future he would like to be a jazz pianist, and he wrestles with the complexity of improvisation on a daily basis. While Patrick enjoys reading about himself, he thinks writing about himself in the third person is kind of weird.